A visit to Government Higher Primary School (GHPS) Banjarapalya, Bengaluru, inspired three students of The International School Bangalore (TISB) in Sarjapur to raise funds and donate a laptop and internet connection to the school. Siddharth Setlur, Aaryan Sharma, and Krithik R of TISB had visited GHPS Banjarapalya in July 2016 for their coursework group project, the topic of which was Education for All and how technology can help achieve this end. The school authorities, including his Headmaster, Mr Paramesh, left the trio mighty impressed with their efforts and the boys decided to aid them by making a donation of a laptop pre-loaded with a learning software and internet connection. The youngsters approached The Akshaya Patra Foundation for their noble endeavour and to fundraise, arranged bake sales, where they baked delicious goodies and sold them, whilst also launching an online crowd-funding campaign. Thus, they raised Rs 14,700, which they used to purchase hardware. 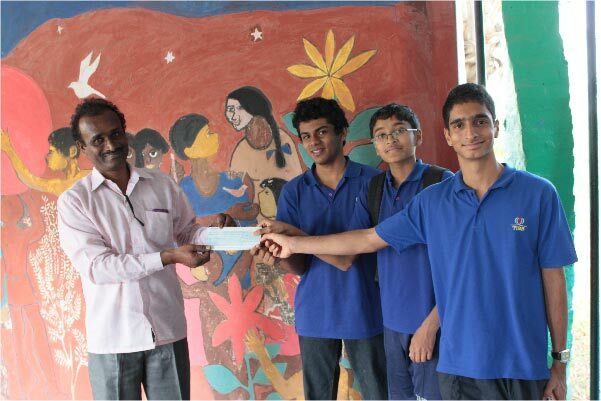 Siddharth, Aaryan and Krithik’s donation will help GHPS Banjarapalya access vital online resources. These include Skype, which the boys hope will help teachers elsewhere communicate with these children as well. When the three had visited the school, the authorities there had told them that they were facing difficulties finding an English teacher. They hope having access to Skype at school will help solve this problem.